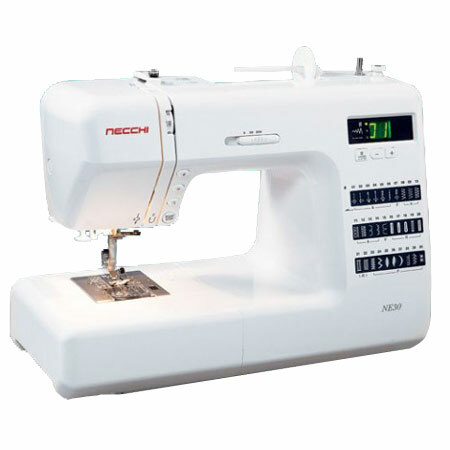 The Necchi NE30 makes the perfect upgrade from your old mechanical sewing machine. This entry level computerized machine offers lots of great features that will help you expand your sewing capabilities and have you sewing like a professional. Use the backlit LCD display and stitch selection buttons to choose from 30 built-in stitches including decorative, utility or 7 different one step buttonhole styles. The NE30 has auto-lock stitch, reverse button, and needle up/down buttons right on the front of the machine making them convenient and easy to find. Use the Start/Stop button and be completely free of the foot control. These great time saving features help you to accomplish your sewing projects faster and more efficiently. The built-in needle threader makes threading the needle a snap. This sewing machine has a top-loading bobbin system and Auto-declutch bobbin winding. The free arm lets you tackle the hems of pants and shirt cuffs with ease. The Instruction Book is illustrated and easy to read. A hard cover is also included to protect your machine and help keep it dust free when not in use. You’ll enjoy sewing with your Necchi NE30 for years to come. This Necchi NE30 includes FREE 1/4" and darning feet. These are not packed with the machine by Necchi. We are offering them as a promotion.